I have been trying to use my solar oven as much as possible this summer to keep the house cool. I have baked breads and casseroles, but my families favorite treat is a Fruit Topped Oatmeal Bar that I made with apricots. I have had access to an abundance of them this year. 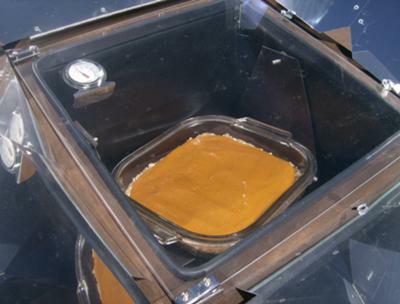 This recipe works great for the solar oven because it gives me the ability to bake at a higher temperature to begin with, between 300-350, then I crack the door and bake at a much lower temperature of around 200 or so. Doing this lets the crust get golden and then allows the top a chance to dry out and turn into sort of a fruit leather without burning, thus creating the perfect treat. This recipe was originally created for a conventional oven, but to have the oven in the house on for that long, in the summer is very counter productive while trying to keep the house cool. This recipe is great with many other fruits and fruit combinations. I have a sister-in-law that uses older bottles of fruit that she needs to use up. Her family loves a cherry and pear combination. I am looking forward to having access to other fresh fruits this summer so I can see for myself if there is a better topping than apricot. 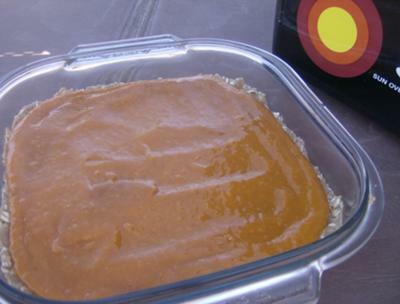 In a mixing bowl combine flour, oats, brown sugar, and baking soda. Cut in butter until mixture resembles course crumbs. Press into an un-greased 9x9 baking pan. Spread with filling almost to the edge, but don't get on pan as it will stick and make a messy clean-up. Bake 300-350 in solar oven for about 45 minutes, until surface looks dry and the crust is golden. Then crack oven door and leave in oven at 200-225 for an additional 1-2 hours until top is leathery. Cool and cut into bars. Enjoy! It sounds like a very tasty treat...healthy too. 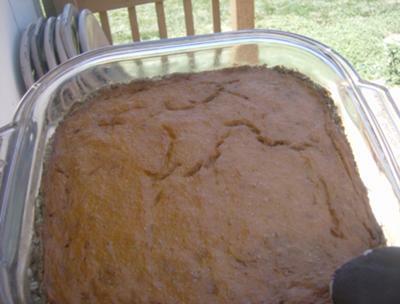 Thank you for putting so much detail into your solar cooking method of creating this dessert. PS. You are right in stating that solar cooking is a great way of keeping the heat out of the house in the summer...especially in St. George.